If you’re a guy and you plan on shaving your head, you don’t have a lot of choices. You can head to a hairdresser or barber and pay anywhere between eight and twenty dollars for someone to come along with a buzzer and take as much of your hair off in one go as humanly possible. You could join the army. That would be somewhat effective provided you actually wanted to join the army as once they’ve done the whole hair dressing job, you’ll actually find yourself enlisted in the armed forces. Another thing you can do is buy your own personal shaver. This is an area that’s littered with choices, most of which either require a steady hand or a friend to help you out. 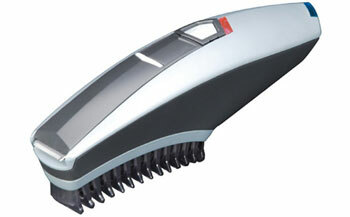 Using a regular electric hair trimmer isn’t easy for most people when they have to shave any part of their head they can’t see, especially when the appliance doing the job has been modeled from the tools which professional hairdressers use. Remington think they might have come up with an answer for this in the form of the Shortcut. Designed as more of curved comb with a shaver built into this form, the Shortcut has been built to make it as easy as possible to trim your hair without needing help from a mate. Think of it as a hair brush with a motorised cutting system that cuts your hair down to size without cutting you up in the process. The Remington Shortcut comes with two plastic guide pieces that allow you to decide if you want a basic cut or a styled cut. In testing it, I’m not sure if the styled one actually produces a “stylish” cut per se. What it does seem to do is offer a slightly different edge. I found myself migrating to the regular plastic guide pretty quickly but every person will be different. Instead of different clip heads like other groomers feature, the Shortcut uses an internal cutting measurement guide which – depending on where you set the number on the wheel – raises or lowers the plastic clipper guide to change the depth of the hair cut. Unfortunately, this numbering system seems to be a little different from what it actually is in real life. Case in point, tests done on myself where I’d normally have a “2” performed on my head ended up giving me one size too small. An observation one might be able to get from this would be to use one or two sizes up from what you’d normally get so you don’t get too shocked once you’re done shearing yourself. Using the Shortcut is easy enough. Simply charge it up, turn it on, and run it through your head. 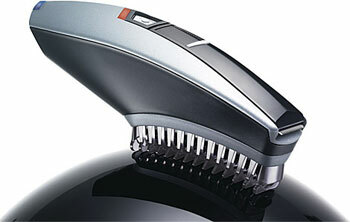 Because it’s curved like your skull, the blades adhere to your hair pretty easily trimming your hair without any fuss. Be careful when pushing too hard as this might change the depth of the cutting. Finishing your hair cut up can be done with the little in-built sideburn trimmer that pops up from the top of the device. It’s not brilliant at what it does but seeing as it’s not doing a whole lot of much, the little vibrating blade beats pulling out a difference gadget to fix up those tufts of hair on the side of your face. Regardless, this reviewer personally found the Remington Shortcut to be a great little device. It made cutting his hair a lot easier, didn’t require any special attention, and over time pays itself off quite nicely.